Graphcomp's Grafman Filters™ are designed by graphic artists for graphic arts to transform photographs and videos to appear hand-drawn. Grafman Filters™ work with Adobe's Photoshop™, Premiere™ and AfterAffects™. 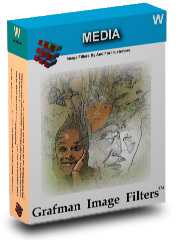 Our first Grafman Filters™ product, Render: MEDIA1™, was released for Windows™ in 1996. Please contact us for info on our Grafman Filters™. Grafman™, Grafman Filters™ and Render: MEDIA1™ are trademarks of Graphcomp. Photoshop™, Premiere™ and AfterAffects™ are trademarks of Adobe Systems Inc.
Windows™ is a trademark of Microsoft Corporation.